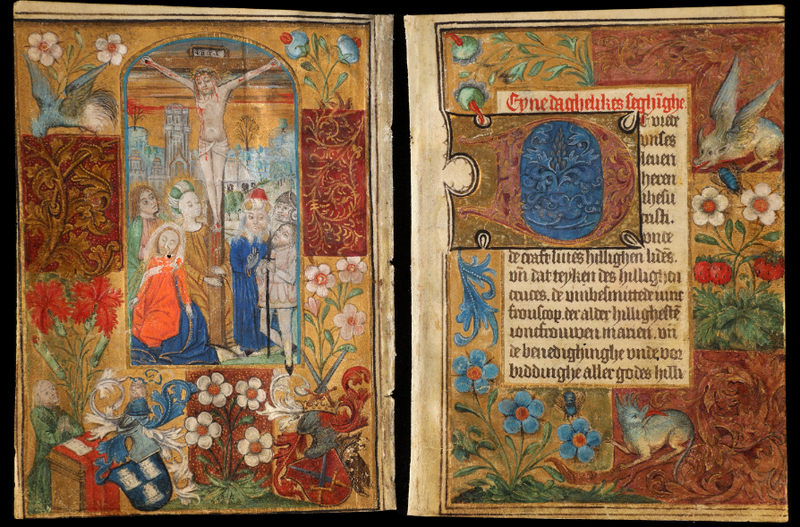 I have Anika Burgess and Vittoria Traverso of Atlas Obscura to thank for the beautiful images you can enjoy below and for the fascinating tale of the Luneborch manuscript; a long-lost 15-century prayer book that had been missing for some 40 years. 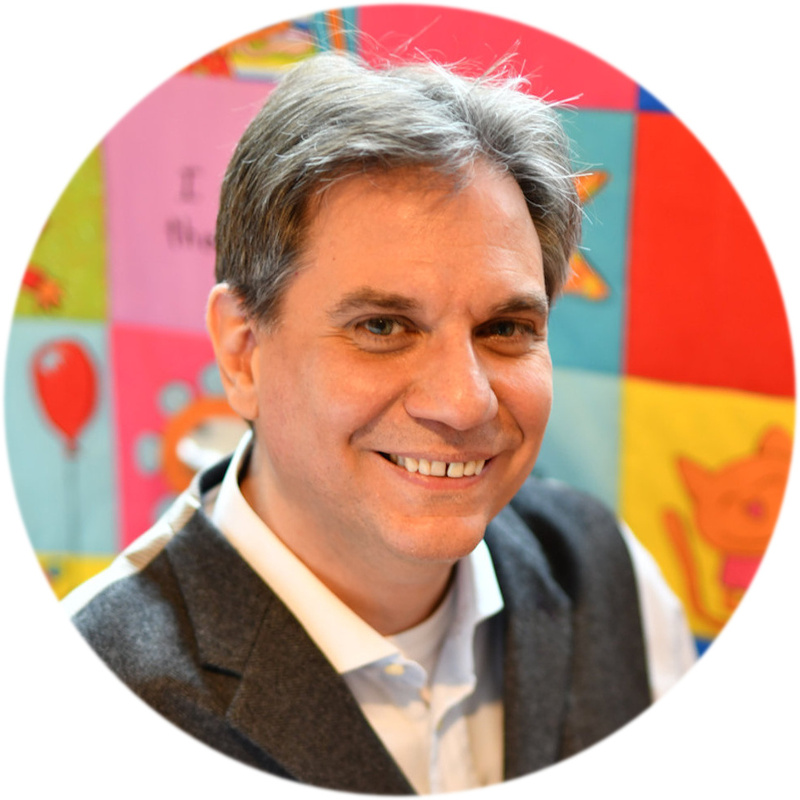 One day in 2012, the rare books assistant at the George Peabody Library at Johns Hopkins University in Baltimore, opened a package that had been delivered to the library’s mailbox. Inside was a long-lost 15th-century illuminated prayer book. A page from the Luneborch Prayer Book. Then, the Peabody Library received an anonymous envelope, with no return address, containing the long-lost Luneborch Prayer Book. The operating theory is that someone from the thief’s family found it and decided to return it to its rightful place. Strangely enough, for 40 years there is no record of anyone trying to sell the book. The Dutch artists who illustrated its pages are known the Masters of Dark Eyes, one of the most prolific groups of illuminators from Renaissance Holland, known for the dark, heavy shadows around the eyes of their figures. The manuscript came from Lübeck, in northern Germany, which in the 15th century was the most important harbor of the Hanseatic League, a trading bloc that stretched from the Baltic to the North Sea. 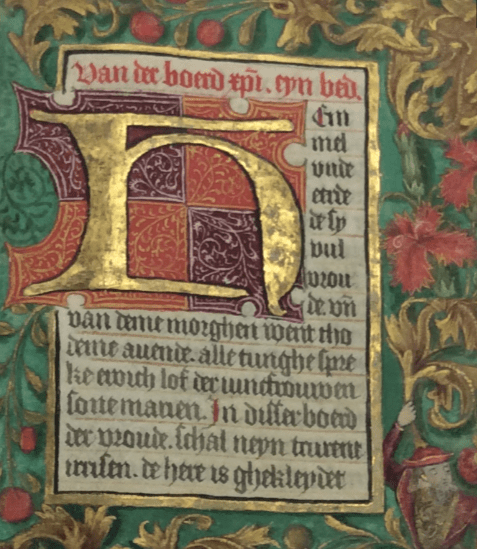 Beyond its indisputable value as a work of art, the book indicates that a German, Hans Luneborch, had appointed a Dutch master to illustrate his personal prayer book. This was news to art historians. At the time, German and Dutch cities were competing, and so far we did not have much evidence of illumination art trade between them. The Luneborch Prayer Book, however, is far from the only stunning example of Medieval and Renaissance art. In the medieval period, monks usually produced books. 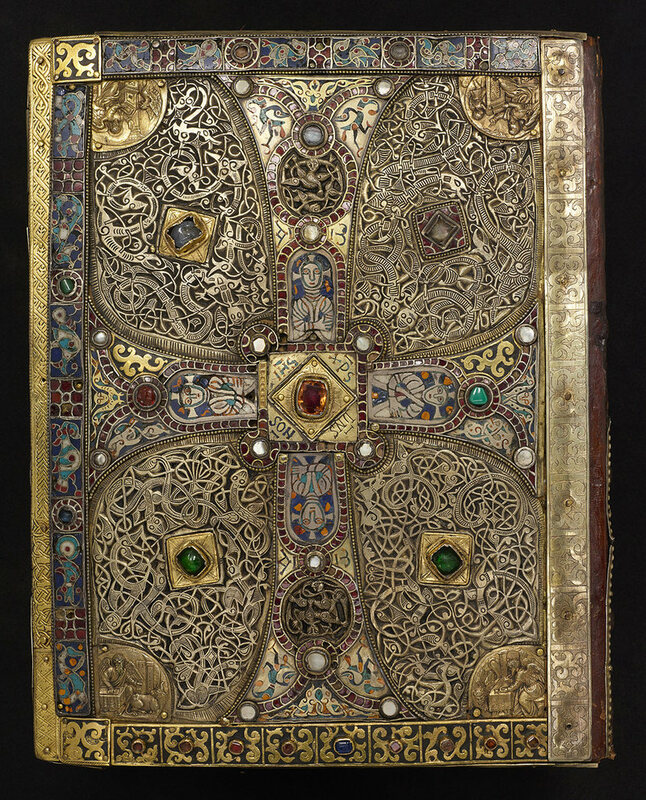 In rare occastions, these included treasure binding: metalworkers were employed to emboss patterns of silver and gold and set precious stones. Either the very wealthy or the very pious (or both) commissioned the books. 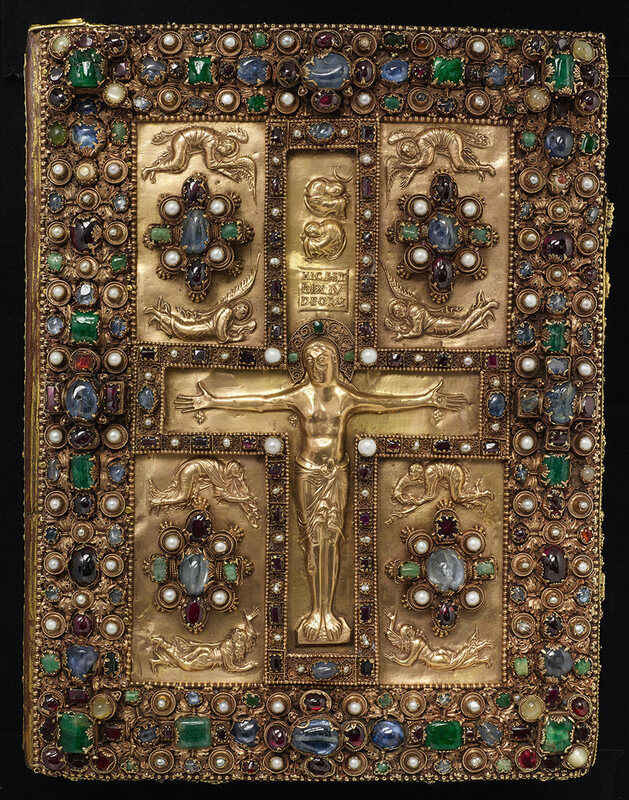 One particularly notable example is the Lindau Gospels, dating to ninth-century France. The intricate metalwork on the back cover only hints at the extravagance of the front cover, which was made nearly a century later. 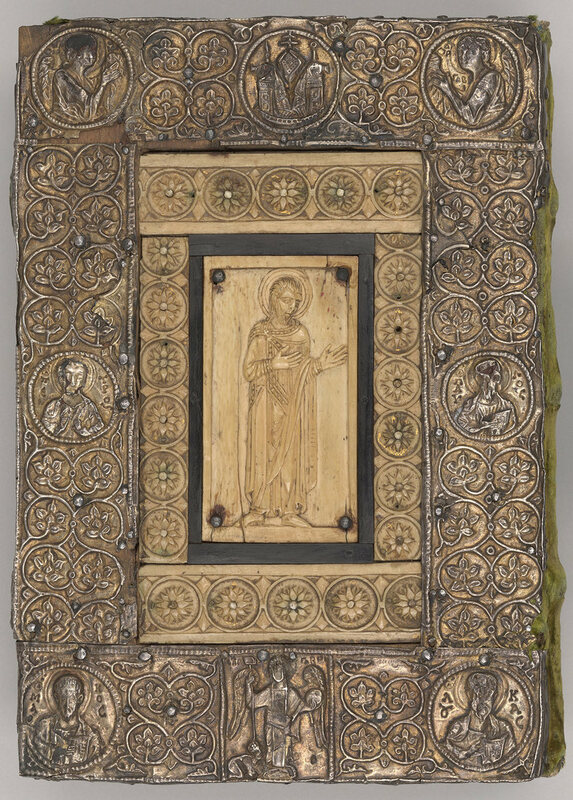 Jewels line the edges and sit on raised clawed legs around a repoussé (metal worked on the reverse side to create an image in relief) figure of Christ. 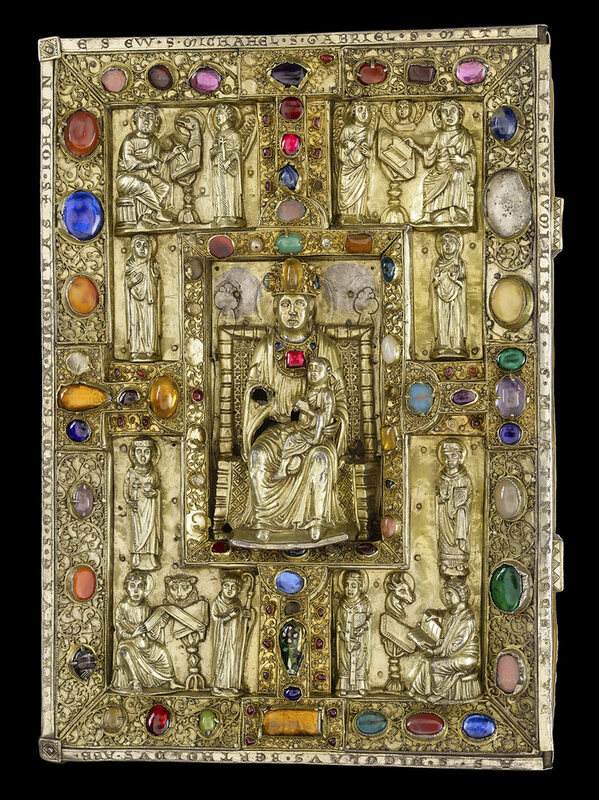 The elevation of the jewel clusters has a practical purpose as well as an aesthetic one; it protects the rest of the cover when the book is open. A handful of libraries around the world hold such books, but not many treasure-bound manuscripts have survived the centuries. 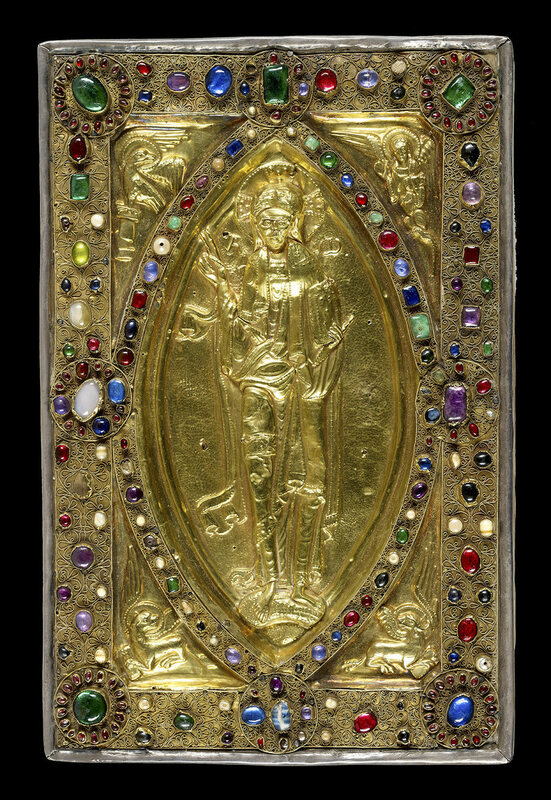 If you are in New York, you can visit Magnificent Gems: Medieval Treasure Bindings — a unique exhibition running through January 7, 2018. Organized by the Morgan Library and Museum, the exhibition includes illustrations of jewels and gemstones from inside the manuscripts. You can enjoy a small selection below. For more images and details of the exhibition, visit Atlas Obscura or the exhibition page itself. Stunning. I particularly like the back cover. It’s very typical of Saxon art that the luckier buggers in my detecting group sometimes find; strap ends and harness pieces usually, in a very similar style. Though in base metals rather than gold. 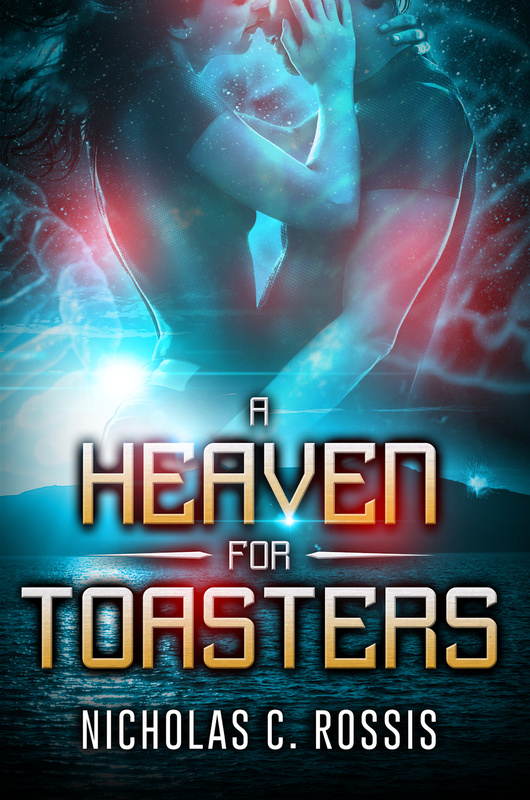 It’s kind of a lovely story. Clearly stolen to order by someone who cherished it for their life time and, possibly, appreciated its artistic worth enough to give it back … Perhaps their family returned it, or maybe the person left instructions to return it after their death, or perhaps in their senior years they sent it back themselves. The most overdue library book ever! Beautiful thing, great story. In my experience, they tend to be smaller than expected. They look pretty fragile and even more precious from up close. this is such classical creation and detailed!! Stunning work… Sadly two-thirds of Leonardo da Vinci’s notebooks are lost… or somewhere in hiding. I didn’t know that! Amazing! Such beautiful creations. Books were indeed treasures in those days! Such wonderful things. It is a joy to know that we still have them, after all this time.